The challenge during autumn in Japan is not finding a gorgeous location, for there are many, but finding a spot where the crowds are thinner, where a photographer can swing their shots without causing injury (to people and the camera), somewhere preferably near to other picturesque hiking spots. Within the main complex at Taimadera, overlooking one of the three buildings housing National Treasures, with one of the two National Treasure listed pagodas in the distance. Taima-dera is a 7th century Buddhist temple complex, and home to several National Treasures and Important Cultural Items: twin pagodas, a bell tower and carved statues of Buddha and warriors, black as only ancient wood becomes. Especially cool were the Jikokuten – Buddhist deities – fierce, warrior statues standing atop their defeated demon foes. These, along with the other statues, reside within the three main temple buildings, which visitors can access for an additional 500 yen. The bell tower housing what is possibly the oldest bell in Japan. The twin pagodas at Taima-dera are famous for remaining exactly as they were at constuction, for the longest. A surprising number of pagodas got moved/sent to other cities as gifts. The entrance gate houses guardian statues considered to be important cultural properties. Even the walk up to Taimadera is pleasant, lined with traditional houses and businesses. There are also beautiful gardens, and tea houses, though these too come with a little extra charge. It is free to stickybeak across the fence however. Enjoying the colour even from a little distance. Fences stop visitors from wandering out the back entrance. A woman is overwhelmed by the gorgeous foliage at Tamairadera. 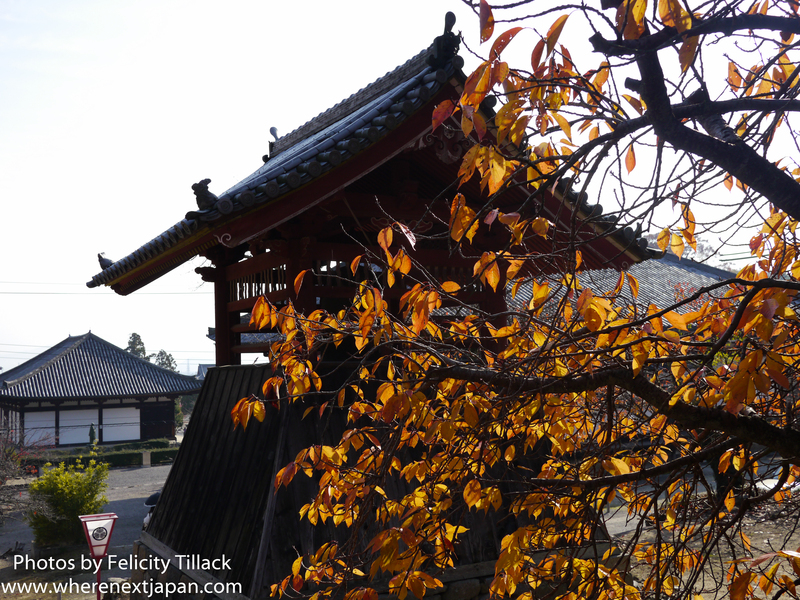 With far less people than any Kyoto temple, but with just as much history and gorgeous scenery to enjoy while meandering, Taimadera is a great autumn day out. Accessible by the Kintestsu Minami-Osaka Line to Taimadera station and a short walk. Limited car parking is available beside the temple for 500 yen, or at a larger space for 600 yen, and 5-10 minutes walk away.